Everything is now about user interaction and digital signage systems are no different, especially since the introduction of kiosks, so to facilitate this a feature has been added into the signage editor to turn any text or picture object into a link to another signage page held on the system. In the page editor simply select the text or picture you want to be a link, then from the drop down selector in the Links section select the page it should link to. That item will then become a link to another page. 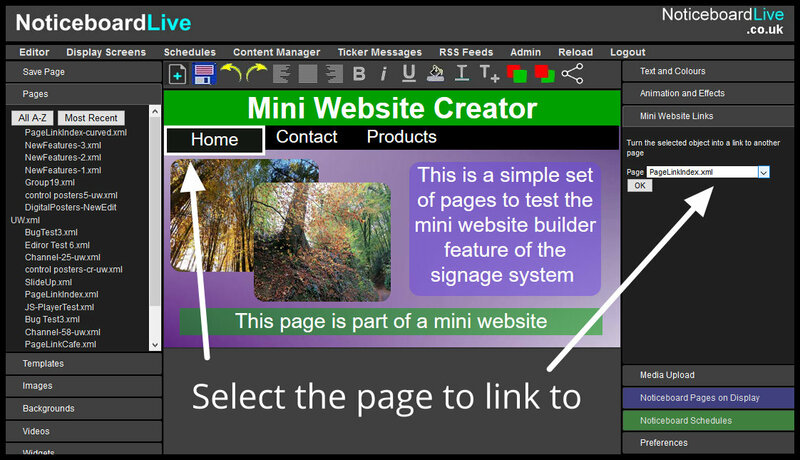 Once you have created a series of linked pages you can then send what is in effect a website to any of your signage channels. This isn’t limited to a single channel, if you had four channels you could put four different websites onto each of them, so different departments could see different information. 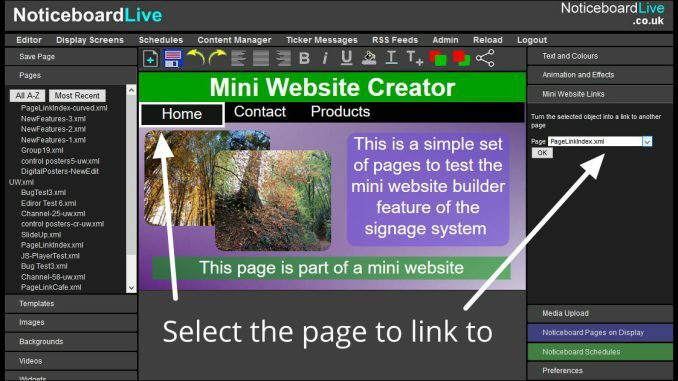 After creating a series of pages with appropriate links in them just add the main ‘home’ page to any of the signage display channels. The signage screen will then display that mini kiosk or tablet website. Any links in the page that are clicked or touched will load in that linked page. It’s important that the display or carousel list only has that one page in it otherwise the system will display it in the cycle of other pages. Also be sure that linked pages all have a link to get back to the main home page. With this solution you can easily send a number of different small websites to any of your digital signage touchscreens or kiosks. Screens configured as multizone screens could show different websites on the same screen in different zones, or the sites can be mixed in with other zones showing conventional signage displays.